HUNTERSVILLE, North Carolina (May 29, 2018) – With Memorial Day weekend in the rearview mirror, the summer stretch of the Monster Energy NASCAR Cup Series is officially upon us as the series heads to Pocono (Pa.) Raceway for Sunday’s Pocono 400. Kyle Busch and the No. 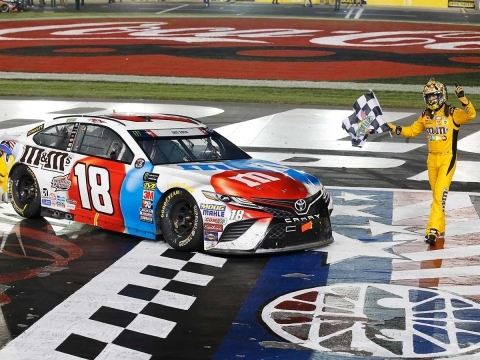 18 M&M’S Red, White, and Blue Toyota Camry team for Joe Gibbs Racing (JGR) has already started to heat up for the summer, as Busch is coming off his first career win in one of NASCAR’s crown jewels – the Coca-Cola 600 at Charlotte (N.C.) Motor Speedway. With the victory Sunday night, Busch became the first driver in NASCAR Cup Series history to win at every track where he has made at least one start, which is 23 tracks in all. During his dominating win at Charlotte, Busch led 377 of 400 laps to put him over the 15,000 career laps-led mark in NASCAR’s top series, becoming just the 10th driver in Cup Series history to do so. In his most recent start at Pocono last July, Busch crossed the 2.5-mile “Tricky Triangle” off his list of tracks where he had yet to win by capturing his first career win there. That left Charlotte as the lone track where he’d made at least one start but had yet to win until this past Sunday night. Busch will bring the M&M’S Red, White and Blue paint scheme he drove to victory lane at Charlotte back to Pocono this weekend. The patriotic scheme celebrates M&M’S Red, White and Blue Mix, which is available at retailers nationwide and is the perfect treat to celebrate summer. While Pocono proved to be difficult for Busch to master for the first six years of his Cup Series career, he seemed to have turned a corner there starting in June 2011, when he started from the pole – his first at Pocono – and was beaten across the finish line only by teammate Denny Hamlin, who has four wins to his credit at the track. Starting with that 2011 season, Busch went on to score seven top-10 finishes at Pocono after driving to just three top-10s in his first 12 starts there. As for 2018, Busch and Kevin Harvick have shown they’ve been the drivers to beat during the first 13 races of the season, combining to win nine of those races. Busch and the M&M’S team have brought home an impressive four of those wins among his eight top-five finishes and 10 top-10s so far, adding three poles to the mix during his very hot start to the season. 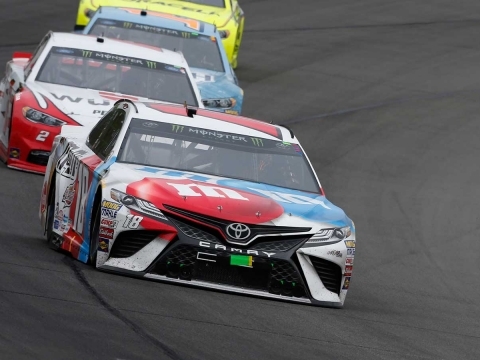 So, as the series heads back to the Pocono Mountains for Sunday’s 400-miler, Busch and the entire M&M’S Red, White, and Blue team hope to start the summer stretch of races on the right foot. They’ll look to add to their impressive list of accomplishments thus far in 2018 as they look to keep their celebrations going through summer and beyond. Last weekend, you became the first driver in the modern era to win at every active track. What does that mean to you? You’ve won four races and you’re leading the points, too. Considering how important the regular-season championship is, have you been cognizant of the fact you’ve been leading the points, and how much are you focused on closing that out? The Pocono 400 will mark Kyle Busch’s 476th career Monster Energy NASCAR Cup Series start and his 27th NASCAR Cup Series start at Pocono (Pa.) Raceway. Busch has career totals of 47 wins, 30 poles, 169 top-five finishes, 251 top-10s and 15,256 laps led in 475 career Cup Series races. His most recent Cup Series win came Sunday night at Charlotte (N.C.) Motor Speedway in NASCAR’s longest race, the Coca-Cola 600. Busch’s most recent pole, the 30th of his career, also came last weekend at Charlotte. Busch has one win, five top-five finishes and 11 top-10s and has led a total of 260 laps in 26 career Cup Series starts at Pocono. Busch’s average Pocono finish is 17.5. 15,000 Plus: With his impressive 377 of 400 laps led in Sunday’s Coca-Cola 600, Busch topped the 15,000-laps-led mark in NASCAR’s top series and became just the 10th driver in NASCAR history to do so. 47 Career Cup Series Wins: With his Cup Series win last weekend at Charlotte, the 47th points-paying win of his career, Busch is now alone in 15th on the all-time wins list as he topped NASCAR Hall of Famer Buck Baker’s 46 wins and sits one behind another Hall of Famer, Herb Thomas. With his 40th Cup Series victory at Bristol last August, Busch became the fourth-youngest driver to reach 40 Cup Series wins at 32 years, 109 days, behind only Richard Petty, Jeff Gordon, and Thomas. All 23: With his win last weekend at Charlotte, Busch has now won a Cup Series race at all 23 tracks at which the series competes, becoming the first driver in the modern era to win at every track where he has made at least one start. Of the 23 different tracks where Busch has won, he has multiple wins at 12 of them. All-Time JGR Wins Leader: With his Brickyard 400 win in July 2016, Busch passed Tony Stewart for most all-time Cup Series wins for JGR. Busch now has 43 wins for JGR to Stewart’s 33 following his most recent win at Charlotte last month.